If you are looking for information on the Ziiing Frozen Yogurt franchise business opportunity, Ziiing franchises or Ziiing Yogurt franchising, then you have come to the right place. Ziiing frozen yogurt by Juice It Up! is a powerful new brand created to satisfy huge customer interest and demand for authentic, healthy yogurt. This new generation yogurt is served in ultra modern Ziiing environments that are fun, sophisticated and social. The Ziiing brand is now offered from a leading franchise organization with national reach as multiple, single and co-branded opportunities. 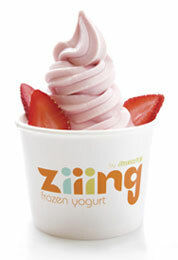 Ziiing frozen yogurt's proprietary tart taste profile is a distinctive, refreshing experience for healthy treat seekers. Classic plain tart and exotic tart flavors are the perfect base for amazing fresh fruit and organic dry toppings. Youthful, trendsetting and health-conscious, the Ziiing customer wants it all - convenience, health, image and fun - and Ziiing delivers, from suburban neighborhoods to metro centers. Hip, energizing and upscale the Ziiing concept is progressive to the core. Offering franchise owners a flexible footprint that stretches to take advantage of varied market and real estate opportunities. From kiosks to stand alone flagship stores, Ziiing meets the need brilliantly. Ziiing is offering franchises to qualified individuals for single unit, multiunit, state and regional Area Development Agreements as well as international and co-branded yogurt/smoothie opportunities. Ziiing seeks individuals who are passionate and committed to put in the time and effort necessary to realize the maximum potential attainable from each franchise location. Understanding and agreement with the Ziiing concept of high standards, operations and customer service. Desire and ability to participate and conform with our operating system. An enthusiastic and entrepreneurial spirit. Willingness to devote full-time efforts to this business. Consistent employment or business ownership history. Working knowledge of accounting and financial reports. Training and ongoing field and management support from Ziiing, LLC Franchisor.